Online store inventory and billing software Integration. This tool is used to integrate Magento and other online eCommerce stores with MaxxERP. Details of Customers and orders will get downloaded to MaxxERP. Details of Products with current stock status and order process status will get updated to the online store. MaxxCommerceConnector is a business booster too that helps you integrate your online eCommerce store with MaxxERP. It is easy and possible to sell your goods online as well as on premise at your store and get your inventory & order status updated back to your online eCommerce store automatically. 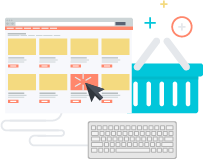 MaxxCommerceConnector tool downloads orders and customer information from the store and updates the stock levels and order status back to the store ensuring clarity in transactions and customer satisfaction. Integrates the physical and the virtual online store. Auto download of Orders to the pending orders list. Instant update of Inventory levels online on sales/returns. Never go out of stock upon order placement. Save time and efforts of manual order entry. Auto inventory levels update in the online store. Hassle free online order processing and invoicing.